Stoneware; relief; 0.5L, 0.25L or 0.125L; pewter lid. The text on this stein is from a poem by Josef Viktor von Scheffel, written in 1847 and set to music in 1872 by Stephen Gruwe. 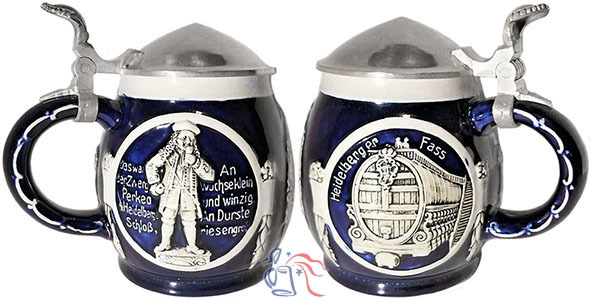 Perkeo (pictured with the text, below left), was an 18th-century dwarf who served as both court jester and keeper of the royal wine keg in Heidelberg castle. Despite his size, he was reportedly quite a prodigious drinker and, according to legend, his death came about when he mistakenly drank a glass of water. 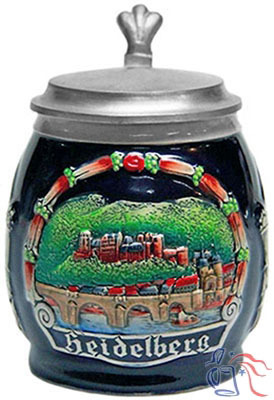 The stein’s central image depicts Heidelberg castle, and seen on the left side is the castle’s 58,100-gallon royal wine keg, purportedly the largest wooden barrel in the world.